Tiara 3100 open was originally built in 1979-91. The new model introduced in 1992 is an entire update altogether. We did the bedding for this 1996 Tiara 3100 Open. The interior is larger than the older models also including top quality systems and hardware. As I always like to mention, we make everything custom according to the size and shape of your bed. This bed is truly a good example. It is a two-piece mattress here. The odd size and shapes of boat beds and then imagine the two-piece mattress and the dilemma of putting the sheets and bedding on it. Well, this is what we actually specialize in. Our mattresses and toppers can be made any shape you want and off course in two pieces too! We can use any material you prefer but we always recommend Latex. The benefits of a latex mattress include being mold and mildew resistant, extremely comfortable, latex helps regulate body heat, which allows you to sleep cooler and it is bendable and breathable. Latex mattresses are very easy to fold in and get into tighter spaces. Our 600 Thread Count long staple cotton sheets are available in four colors and custom fit for your yacht mattress configuration. Each set includes a flat sheet, fitted sheet with matching pillowcases. They provide a manicured look for your bedding, ease in making the bed and a great night’s rest. You see our custom quilted coverlet in this image here. Our coverlets fit the size of your bed, are quilted with a medium weight batting, have a piping trim edge and a drop to give a beautiful look. 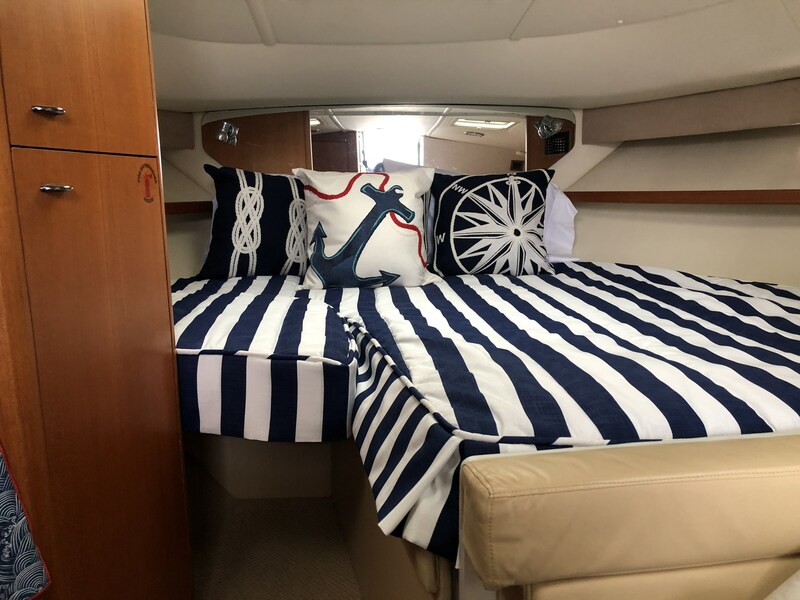 Here, the Navy and white combination is giving a very clean and fresh look to the entire stateroom. 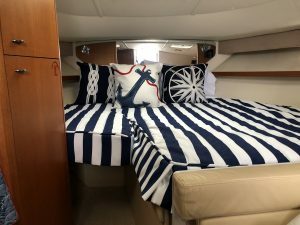 The Nautical print throw pillows are creating an awesome focal point, bringing the whole design together. We have a wide variety of fabrics on our website to choose from and you can always call our showroom to find out about our Sunbrella Collection. Putting together ideas and creating a design solution for your yacht interior is what our design team is best at. Feel free to email us and we will be happy to help your out with any inquiries you have.